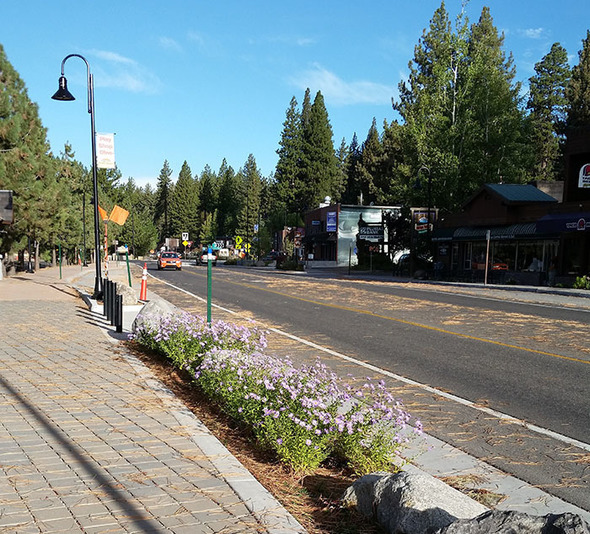 With school starting up again, the traffic volumes around North Lake Tahoe have decreased, but the road construction related to the Kings Beach make-over continues. Below is a summary of activities still on schedule for this fall. Placer County is in the process of closing out the contract with Q & D Construction. Recently, Q & D completed a few remaining contract items, repaired some damaged improvements, and has been working on the replacement plantings and associated maintenance. 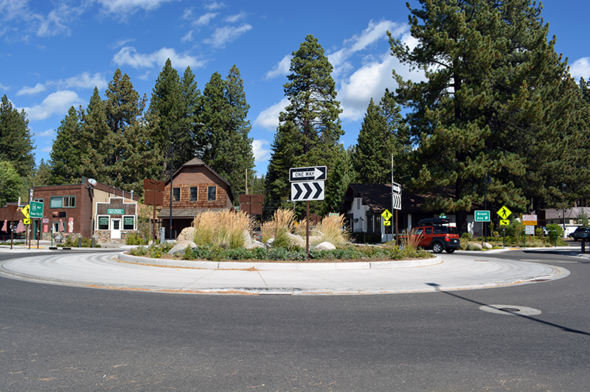 Disney Construction is extending streetscape improvements on both ends of Highway 28 as well as completing some additional grid improvements. Their work does include the installation of a dedicated right turn pocket at the intersection of state routes 28 and 267, and does not include the construction of a roundabout as we have often heard from community members. Disney also utilizes temporary pavement lane markings to shift traffic back and forth in order to make room for the construction crews. So what is seen today is not what will be there in the final configuration. We have some very busy weeks ahead with roadway grinding, paving and striping which will potentially cause major traffic delays. We are in the final stretch to finish the project before the end of the year. At the west end of the project, work activities have shifted to the south side of 28, where curb, gutter and sidewalk work is underway. Some Saturday work, including concrete placement, will be performed during the daytime, between 7 a.m. and 5 p.m. Partial pavement grinding was performed on Sept. 21, and the remainder of pavement grinding will take place on Tuesday, Sept. 27, beginning at 5 a.m. and finishing before the afternoon rush hour. These grinding operations are in preparation for finish the paving of the entire west end, which will be done over two days: Wednesday, Sept. 28 and Thursday, Sept. 29. Paving operations will start at 9 a.m. on both days, and are anticipated to be complete each day at about 8 p.m. Ambient temperatures are critical to the performance of the final pavement and why nighttime work is not an option. Phasing of the grinding and paving operations and traffic control will be sequenced to minimize traffic delays during peak travel hours, however delays through the 28/267 intersection should be anticipated between Sept. 27 – 29. On state Route 28, this new pavement will extend from the eastern Safeway parking lot to the intersection of Secline Street. On 267, the new pavement will extend to the north side of the fire station. At the east end of the project, lanes have been re-striped to temporarily shift traffic to the south for curb, gutter and sidewalk work on the north side of state Route 28. Signage remains in place for a temporary pedestrian detour between Chipmunk Street south and Stevenson’s Holliday Inn, guiding pedestrians to use Brockway Vista and avoid construction activities for this area along 28. Daytime underground storm drain work continues on Chipmunk Street north of 28, between 7 a.m. and 5 p.m., Monday through Friday. Chipmunk Street will remain closed between 28 and Minnow for approximately another four weeks, and detour signage will remain in place and will guide local traffic around the work zone via Fox and Minnow streets. The state Route 28 paving at the east end of the project will be performed in the beginning of October. New pavement on 28 will extend from in front of the Char Pit to east of the South Chipmunk intersection. Overlay paving on Salmon and Chipmunk streets will be done during the middle of October. Bear with us, folks – we are nearing the end of the season, as well as the end of this project. We appreciate your patience so much!